Q: What comes with the HeartFlex? 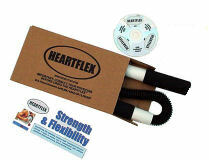 Q: Why the name HeartFlex? A: The HeartFlex raises the heart rate while it builds upper body strength. Q: What makes HeartFlex special? A: HeartFlex exercise is powered by an assembly of nineteen interlocking ball and socket parts. There are eighteen joints between these parts that act as “miniature brakes” and they resist movement through friction. Force must be continuously exerted on the assembly in order to alter its shape. This resistance “across the complete range of motion performed” is calibrated to replicate the resistance of a hand moving through water. Trainers have called HeartFlex exercise “swimming without the water.” Like swimming - HeartFlexing combines multiple repetitions with resistance exercise and builds powerful muscles while improving overall fitness and health. Q: Can its resistance level be changed? A: No. Like swimming, HeartFlex has only one resistance level. Swimming is the best overall exercise and HeartFlex is designed to produce similar results. Swimming and HeartFlexing for short durations are easy to do and the workouts they create become progressively more intense the longer they are performed. By increasing repetitions both swimming and HeartFlexing effectively train everyone from beginning exerciser to the most elite athlete. Like swimming; HeartFlexing builds dense, flexible, muscle tissue as it boosts circulation and improves overall fitness and health. Q: How much does HeartFlex weigh? A: Only 9 ounces. It was designed to be lightweight so that it would minimize eccentric stress to the shoulder rotator cuffs. Q: How big is HeartFlex? 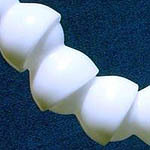 A: HeartFlex is 25" long and its main body is 1" in diameter. Its two handles are 4 3/4" long and 1 1/2" in diameter. Q: Is it easy to pack? A: Yes, and it travels easily. A: With regular use and proper care HeartFlex will last a couple of years. Q: Will it wear out? A: Yes. The HeartFlex resistance assembly is made up of 18 precision ball and socket joints that act as "mini brakes." The frictional resistance of these "mini brakes" is what gives HeartFlex its patented "consistent resistance." When the brakes wear out the unit needs to be replaced. Q: Is HeartFlex difficult to use? A: No. 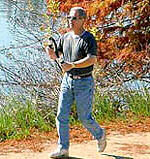 HeartFlex was designed to be fun and easy. An instructional DVD accompanies each unit. 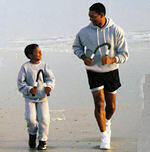 The DVD explains the concept behind HeartFlex, gives care instructions, illustrates 35 different HeartFlex moves, and has special videos concerning walking and playing golf. Q: What is HeartFlex's guarantee? A: HeartFlex has a thirty day "money back" guarantee and will be replaced, at any time, for manufacturing defects. Q: Are you accepting or looking for dealers or distributors for your product? A: Yes we are. You can contact John Corbin via email for more information on becoming a dealer or distributor.